In $\Delta ABC,$ circle $(O)$ through $A$ and cuts $BC$ in $D_1$ and $D_2$ and sides $AB$ and $AC$ in $E$ and $F,$ respectively. 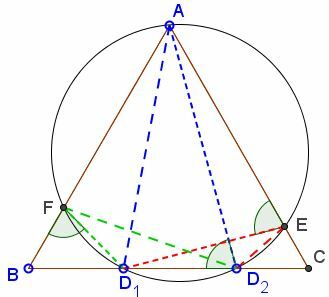 As has been done previously, $\angle D_1FB=\angle AD_2B=\angle D_1EA.$ It thus follows from the slanted Viviani theorem that $D_1E + D_1F = AD_2.$ $D_2E + D_2F=AD_1$ is proved similarly. Gobbalipur Jayanth has shown that his previous proof extends to the case where the given circle is not required to be tangent to the base $BC.$ His proof easily handles the more general case. 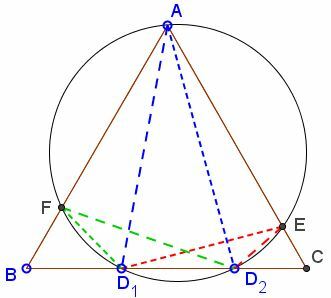 However, as was observed by Grégoire Nicollier, both follow from the slanted Viviani theorem. Above, we have adopted Grégoire's approach.